During berry season, I’m likely to have several kinds of berries in my kitchen at any given time. Recently, I had some blueberries in my refrigerator just begging to be turned into something sweet and delicious. When I remembered a recipe for Blueberry Coffee Cake I’d bookmarked a while back, I couldn’t wait to get baking! This is a simple cake, both in preparation and in flavor. 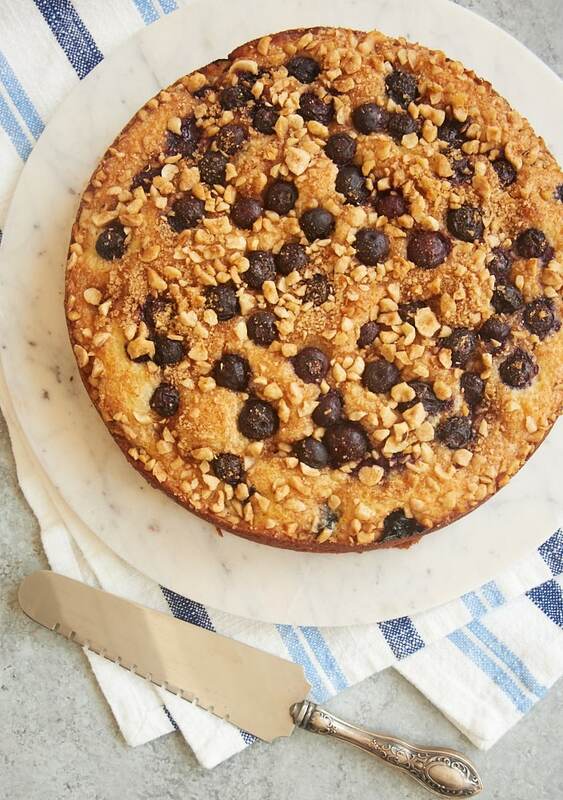 It mixes quickly and easily, and it focuses heavily on sweet blueberries with some nuts for crunch and a little cinnamon for a bit of a flavor twist. And I have to say that it’s absolutely wonderful. 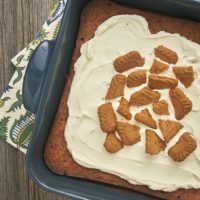 The addition of yogurt to the batter makes the cake delightfully soft and moist. 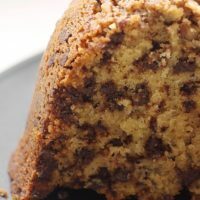 It’s a bit less dense than a lot of coffee cakes, making this cake is a nice departure from the norm. I opted to use vanilla yogurt for a bit of flavor, but plain yogurt will work, too. 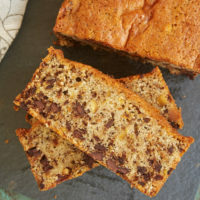 There’s no vanilla extract in the recipe, but you can add 1/2 teaspoon or so if you still want a little vanilla flavor. When you’re mixing the batter, you may be reminded of making muffins. The method of mixing is quite similar to the muffin method. In fact, eating this cake is a lot like eating a soft, fluffy muffin. That makes it a great choice for a special breakfast or brunch treat. I like to use fresh blueberries for this cake, but it’s worth noting that the original recipe specified using frozen berries. That’s great news for those times you are craving a blueberry treat but don’t have any fresh ones available. Just remember that frozen berries have some extra moisture, which can sometimes cause the color to bleed or the finished product to be a bit soggy. I recommend rinsing and drying frozen berries just as you would fresh ones to lessen those effects. I am so enamored with this cake! It’s a prime example of how fantastic a simple cake can be. No frills, no fuss, just deliciousness. 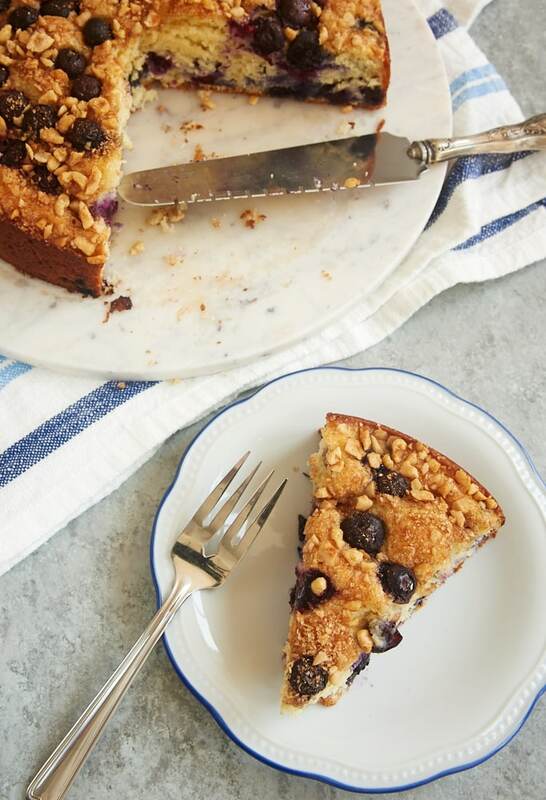 If you love the sound of that, too, then I think this cake will become one of your new go-to recipes for a morning treat, an afternoon snack, or a lightly sweet dessert. 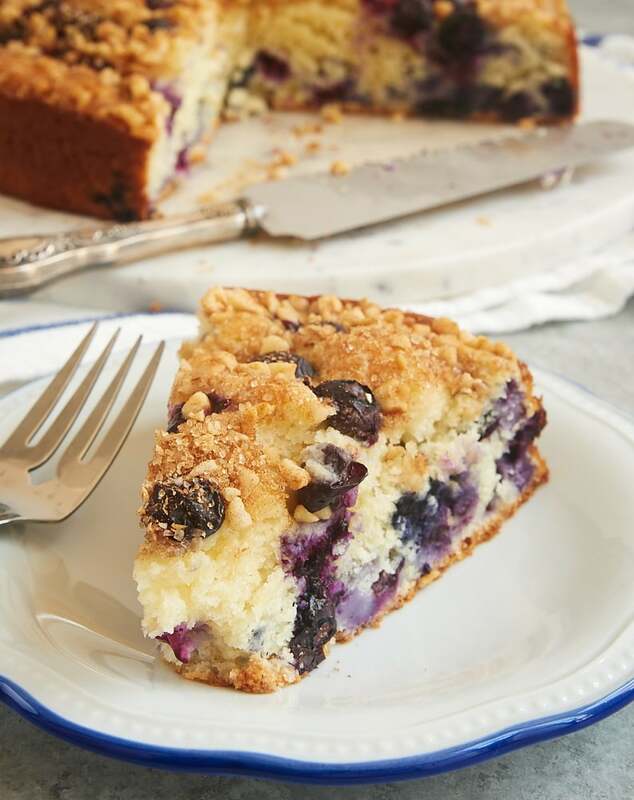 This quick and easy Blueberry Coffee Cake is ALL about the blueberries. 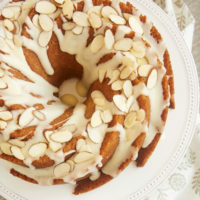 Such a lovely cake for breakfast, an afternoon snack, or a lightly sweet dessert! Whisk the 2 cups of flour with the sugar, baking powder, and salt. Set aside. In a large bowl, whisk together the egg, milk, yogurt, and oil. Gradually add the flour mixture, mixing just until combined. Set aside 1/4 cup of blueberries. 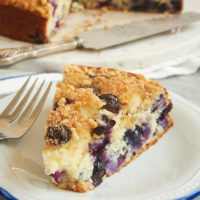 Toss the remaining blueberries with 1 tablespoon of flour, and gently fold them into the batter. Transfer the batter to the prepared pan, and spread evenly. Sprinkle the reserved blueberries over the top of the batter. Combine the hazelnuts, turbinado sugar, and cinnamon. Sprinkle over the top of the batter. Bake 30 to 35 minutes, or until a pick inserted into the center comes out clean. Cool in the pan for about 15 minutes before removing the sides of the pan. *Turbinado sugar is a coarse sugar that’s less processed than brown sugar. It has a brown color, which works well aesthetically on top of this cake. You can alternately use sanding sugar or another coarse sugar. **Using a springform pan makes it easier to remove the cake from the pan without damaging the topping. You can use a cake pan, but you’ll need to flip the cake out of the pan and then again to get it right side up, which may affect the topping. Recipe slightly adapted from Southern Living. I don’t care for yogurt so never have it around but almost always have sour cream. Can I use that instead? Hi, Mel. I can’t say for sure because I’ve not tried that substitution with this recipe. Sour cream is usually a good substitute for yogurt, so I’d guess it would work. If you try it, please let us know how it works. 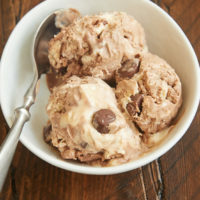 I can think that a tad of almond flavor in this would also be good!! Could I use frozen blueberries instead of fresh? Hi, Nicole. My tips for using frozen berries are included toward the end of the post. I don’t see where the 3 tablespoons of veg oil are used. Thanks for pointing out my omission, Dawn! It’s mixed with the other wet ingredients. I’ve updated the recipe. Could you please tell me where the coffee is in the recipe or am I being stupid lol ? Hi, Julie. There’s no coffee in the recipe. 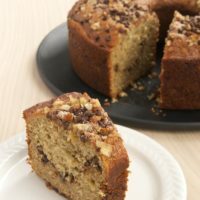 “Coffee cake” refers to cakes like this that are often enjoyed with coffee. A bit of a silly term, really. You could also call it a crumb cake if you like.